November 2017 Update: now available in new colors! I’m happy to announce the launch of the Pocket Art Toolkit, available now in my Shop! 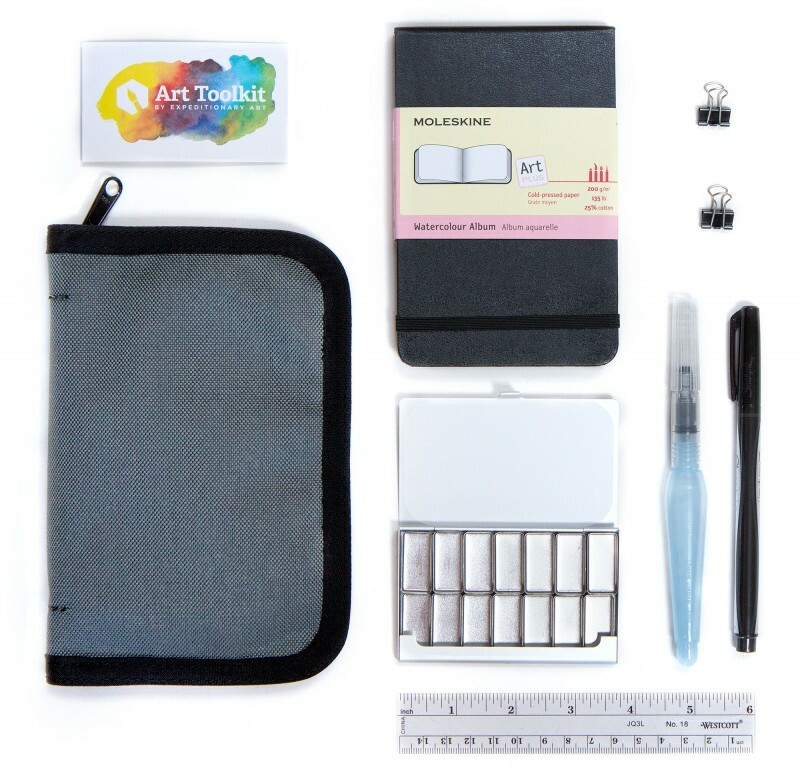 Designed to fit a standard Moleskine watercolor notebook, this compact version of the Art Toolkit is perfect for lightweight, on-the-go sketching and painting. 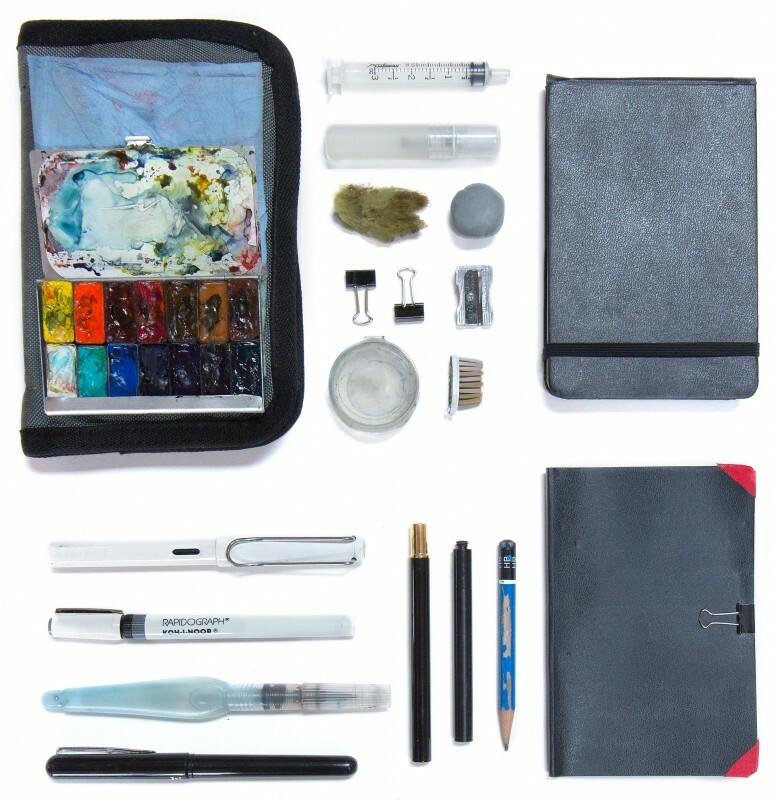 The Pocket Art Toolkit contains field sketching essentials including a Pocket Palette, Moleskine watercolor notebook, waterbrush, waterproof fine pen, 6 inch ruler, and two mini clips. These are all contained in a rugged, Cordura zip cover that measures just under 5″ x 7.5″ when closed. I started sewing prototypes and experimenting with ideas for the Pocket Art Toolkit over a year ago, after I began sketching panoramas in a small Moleskine watercolor notebook. While I love my original Art Toolkit for its flexible loose-leaf paper system and capacity for more tools (here’s an example of what I carry in it), I wanted something even smaller and lighter for my everyday doodles and explorations. Some of you may have spotted my Pocket Art Toolkit prototypes as I’ve been testing them out, such as on Vashon Island or around Seattle. Here’s a look at what I’m currently carrying. The three pockets on each side and vertical sleeves allow a number of tools to be stored. I have a one watercolor notebook, one standard slim notebook, a Pocket Palette, towel, refill syringe, mister, natural sponge, gum eraser, clips, sharpener, mini water container, toothbrush head, Lamy Safari pen, Rapidograph 0.35mm pen, Silver Black Velvet #8 travel brush, Da Vinci #3 Maestro sable brush, and HB pencil. Zipped up, the whole kit fits nicely inside a purse or large pocket. I hope that the Art Toolkit system of kits and compact sketching supplies inspires you to sketch anytime, anywhere! This! I really like how you continue to refine the Toolkit. This version will fit my current purse, and everything will be easily findable. Currently I’ve got watercolor pencils boxed next to my moleskine, and pen, pencil, and waterbrush floating in a section. I’d much rather have the pocket pallette for color, taking up less space! Thank you! I’m a fan of having all of my supplies in self-contained kits so they’re always ready to use. Very nice tool. It looks to be very useful. Good Job! I love how you like to be as compact as possible. I, too have a very economical sketching kit however, I now use the larger Moleskine. But I’m very tempted to buy yours because it just looks so good! I’ve only just found your response to my question about the Antarctic competition! This is perfect! I have the original toolkit, and often wish it was just a bit smaller, and now it is. Also, I find I like doing my paintings in watercolor book instead of loose sheets of paper, making this even more perfect. My original toolkit is still in perfect condition, now I’ll be able to gift it to a friend who likes to paint on loose sheets. Thank you for making sketch painting in the outdoors compact and portable. The cover itself weighs just under 3oz. Cheers! Maria, I received my Pocket Toolkit today. It is wonderful! So sturdy and well-made. Even the zipper is sturdy! All of my sketching necessities fit nicely. I love it! Thanks so much for creating it and making it available for sale! I’m so glad you like it! It’s locally made in the Pacific NW as well. :) Happy sketching! Mine just arrived and I absolutely love it! Such a high quality cover. I’ve decided to keep the moleskine outside so I can carry a few more pens. Thanks again for creating such a useful product – and fast shipping too! Will 4 x 6 inch watercolor postcards fit (instead of the notebook)? 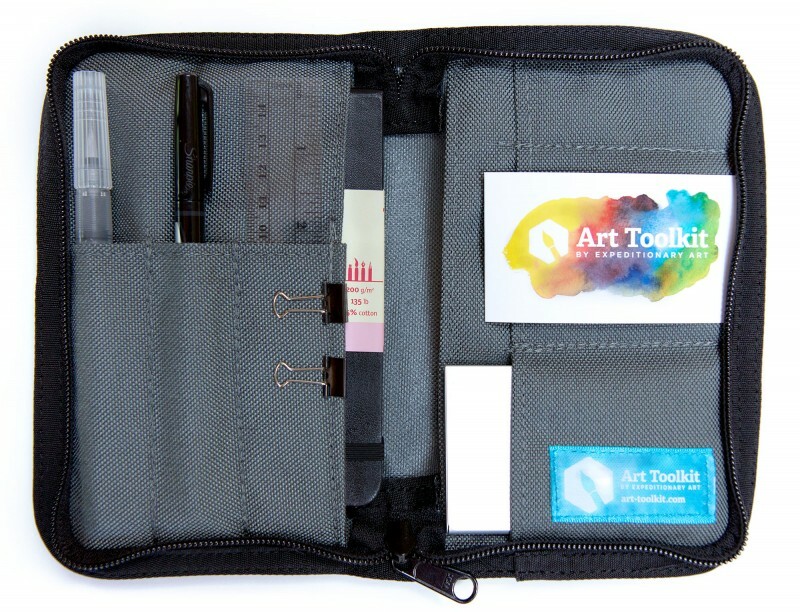 Hi Sandy, the Pocket Art Toolkit is sized just so for the 3.5″ x 5.5 Moleskine style notebook and won’t fit 4″ x 6″ postcards. My larger Art Toolkit has the space, though! Hi Maria! I have absolutely loved your kit for the past couple of years-since I ran across it the first time. I have tried putting together things in a similar fashion, but nothing is quite compact or lightweight enough! Since I own almost everything in your kit but the carrier (this new one that you’re using rather than the ring binder one) that holds it all and your amazingly tiny palette, is it possible to buy just those two things? I simply don’t need the contents except for the palette but I love what you have designed to carry the maximum in a minimal space! Thank you for your help! Thank you for your kind words, Elaine! I’ll be in touch with you directly regarding the Pocket Art Toolkit cover. Thank you! Nice job w/ur developem’t of the pocket palette! Such a great size!! I love it. At-a-glance week or monthly schedulers, & even garden book covers. W/these u could paint a page w/individual flowers on them to separate their info & care section. But for u Maria, u could do a section on different birds in ur own cute little style and sell the pages! Just a thought to pass on. My pocket palette arrived today and I am enchanted by it! So tiny but functional. Thank you very much. It is not clear to me if the Art Tool Kit comes with the watercolor pigments you list or if we purchase those on our own. Please advise. Thanks. Oh my word. Oh the inexpressible joy to finally having the Pocket Art Toolkit in my hands. Thank you Maria, for your insight and ingenuity. I’ll be in sketching heaven whenever I go out because it will live in my bag. Thank you. Thank you. Thank you. Oh my goodness, you are so welcome, Cheryl! Sharing art and tools with artists around the world brings me such joy. Happy sketching! Thank you for the suggestion, Charles! 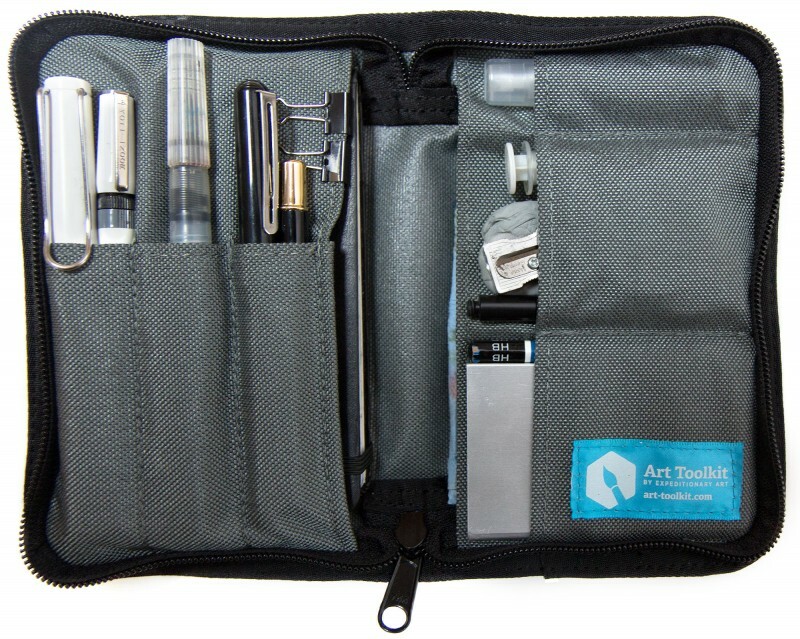 I definitely enjoy having different sizes of kits ready to go- the Pocket Art Toolkit as my “everywhere kit”, the larger Toolkit when I have more time, then I have my whole art backpack when I’ve got a couple of hours to paint. It’s nice to think about something else in between. I just ordered this kit. It has the same size as my handmade travel journals, so perfect! With a little luck I it arrives before I go on a weekend trip with my family. I already have a pocket palette and love it! It looks so small, but the pans hold more color than it seems! Received the pocket art toolkit last week, handy, small, well made, I am in love ! thank you ! At age 79 my brother-in-law has taken up drawing and watercolor painting, so I got him the Pocket Art Toolkit for Christmas. He likes it a lot and took it along when we two couples took a Danube/Rhine river cruise last May. Three of the four of us had a great time sitting out on the deck doing our little travel paintings. I am a beginner artist taking my first watercolor class from Che, in Kirkland. He says Hello! He loves his pocket art kit and prefers it to the larger art kit with a binder and paper. I am very undecided which one to buy from you and would love your suggestions. I can easily travel with either kit. Can you help me decide? ie. pros & cons for the inexperienced but enthusiastic beginner who’s loving her new passion! Perhaps you see a preferential trend from more experienced artists? Thank you, Maria! I appreciate the careful thought that went into the kit and look forward to bringing (water)color to my travel sketches! I’ve always been a tube-based (amateur) watercolorist, so am not so familiar with setting up a palette the night before and letting it dry out. But I look forward to trying — thanks too for including friendly instructions!